Édition critique établie par Jacques Allard, Claude Sabourin et Guy Allain En Suisse, un révolutionnaire québécois a la mission d'abattre un agent lié aux forces fédéralistes canadiennes. Though Hubert Aquin (1929–1977) was born and died in Montreal, he spent much time abroad, especially in Paris and Switzerland. Today he is considered by Quebec and by Canada as one of our greatest authors. He also took an interest in radio and television, as well as film; for a number of years he worked for the National Film Board of Canada. But above all else he is known for his novels, and especially Next Episode. The work has sold regularly at the rate of 1500 copies a year since its publication in 1965 — a significant figure for Quebec and its seven million inhabitants. Aquin was offered a Governor General’s award for his second novel Blackout, but refused the award, received the Prix de La Presse for his third novel The Antiphonary, and was awarded the Prix de la Ville de Montréal for Hamlet’s Twin, his fourth and last novel. 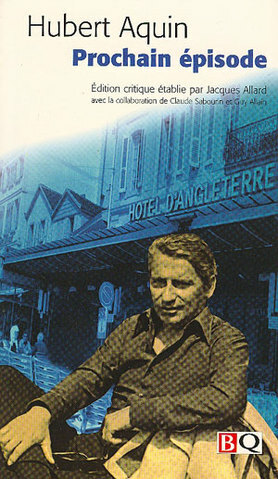 In 1972, he received the Prix David for his entire body of work. Since his death in 1977, Aquin’s oeuvre has been and continues to be the object of numerous journal articles and academic dissertations, not only in Canada but in France, Italy, Germany and elsewhere — all countries where his work is taught.